NEW JERSEY (WTVD) -- A fourth-grader from New Jersey has won the hearts of many after he applied for a job at NASA. Recently, NASA posted a job opening for a "planetary protection officer," a position that NASA has had since the 1960s. The listing created a lot of buzz and even caught the eye of 9-year-old Jack Davis. Officials say the position "plays an important role in promoting the responsible exploration of our solar system by preventing microbial contamination of other planets and our own." After seeing the opening, the fourth grader couldn't help up but apply and help defend our planet. In an adorable letter dated August 4, Jack said he believed he would be suitable for the role because, "my sister says I am an alien" and that, "I am so young, so I can learn to think like an alien." His other qualifications? Watching "Agents of S.H.I.E.L.D." and his video games skills. After listing why he'd be the best fit, he signed the letter with "Jack Davis, Guardian of the Galaxy." "Our Planetary Protection Officer position is really cool and is very important work. It's about protecting Earth from tiny microbes when we bring back samples from the Moon, asteroids, and Mars. It's also about protecting other planets and moons from our germs as we responsibly explore the Solar System." Green encouraged Davis to "study hard and do well in school," and said, "we hope to see you here at NASA one of these days." Davis also got a phone call from Planetary Research Director Jonathan Rall, who thanked and congratulated him on his interest in the job, NASA reported. 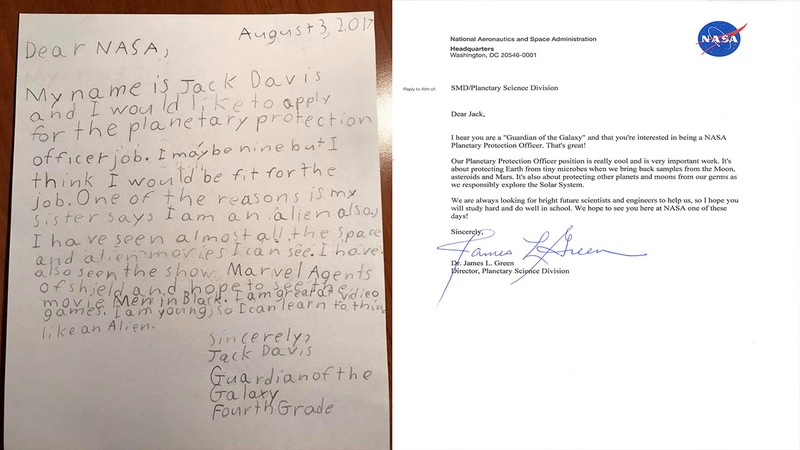 Jack Davis got a special call from NASA's Planetary Research Director, Jonathan Rall, congratulating Jack on his interest in serving as the agency's Planetary Protection Officer. "At NASA, we love to teach kids about space and inspire them to be the next generation of explorers," Green said in a news release. "Think of it as a gravity assist -- a boost that may positively and forever change a person's course in life, and our footprint in the universe."